Once a month the Bureau of Labor Statistics (BLS) publishes a report on the state of unemployment in the United States. The major news organizations scan through the report highlights looking for “the unemployment rate” so that they can announce it to their loyal audiences. The number which the BLS promotes as “official” unemployment rate is technically known as U3. The are six different U numbers and U3 was chosen not because it is most accurate but because it is least negative. In effect, economic data is being massaged for political purposes. U4 is more accurate than U3, because it includes “Discouraged Workers”. Discouraged Workers are Americans who have been out of work for so long that they have just simply given up on finding a job. When an American gives up hope, the government stops counting them as officially unemployed. The more Americans who give up looking for work, the better the governments published unemployment statistics get. If everyone stopped looking for work, the official “unemployment rate” would eventually drop to 0%. U5 is even more accurate than U4, because it also includes “Marginally Attached Workers”. Marginally Attached Workers are Americans who want to work, but have not looked for work in the last four weeks. These are people who are on their way to becoming Discouraged Workers but are still not counted as “unemployed” by the official definition. U5, however, is still a very misleading measure of true unemployment. The government counts an American as being employed part-time if that person works even just one hour a week. U6 is the most accurate statistic for unemployment. It also includes Involuntary Part-Time Workers. These are Americans who want to work full-time, but are unable to get full-time jobs. All of these unemployment numbers, however, are less reliable than their opposite number — the Labor Force Participation Rate. The LFPR counts Americans who are working instead of Americans who are not working. 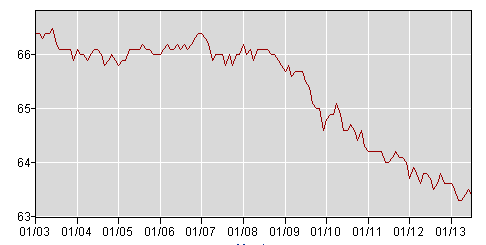 The Labor Force Participation Rate is the labor force as a percentage of the civilian noninstitutional population. This number is slightly more difficult to massage for political purposes without sending more Americans to prison.